Many Highlanders of the advanced school may consider that the foregoing “Puirt-a-Beul” mouth tunes, or articulate music, were not worth preserving. Certainly as far as the poetry is concerned there may be some truth in the statement, but we do not claim the rhymes as poetry. It would be a great mistake to do so, as no effort has ever been made to rank them alongside the more serious efforts of the muse. They were, as a rule, entirely spontaneous, or strung together with little effort, and reflect rather the humorous side of the Highlander in his gayest mood, and are, to say the least, intensely human. The sallies of wit, humour and irony, are numerous throughout, which one ignorant of the language, customs, and habits of the people, will can hardly appreciate. But it was for none of these reasons that the “Puirt” were collected, but to prove beyond the possibility of a doubt that the Highlanders have been from a very remote period an intensely musical people, and had an inexhaustible stock of tunes and songs, and could not therefore have been such an ignorant lot of savages as some historians, and others, endeavour to make them out. Generations before the well-known Strathspey and reel composers were born, the Highlanders had great numbers of these tunes and danced to them in every village, strath and glen throughout the Highlands. Indeed, there is very strong evidence to show that much of our strathspey music was taken originally from the Gaelic. These dancing songs, which are here preserved, are only a fragment of what was once actually in circulation generations and even centuries ago. Not only had many of Marshalls’ and the Gows’ music been laid under contribution, but hundreds more that were never known anywhere else. When we consider that many more must have died out since instrumental music was first introduced into the Highlands, it is a marvel that they did not become entirely extinct long ago. Their preservation is a powerful argument in favour of the tenacity of the tradition in the Highlands. The first attempt to preserve articulate music was made by Captain Neil MacLeod of Gesto, who, in 1828, published a collection of ancient “Canntaireachd’”- piobaireachd – or pibrochs, as verbally taught by the MacCrimmon* pipers in the Isle of Skye, and taken down from John MacCrimmon, piper to the old laird of MacLeod and his grandson the late General MacLeod of MacLeod. 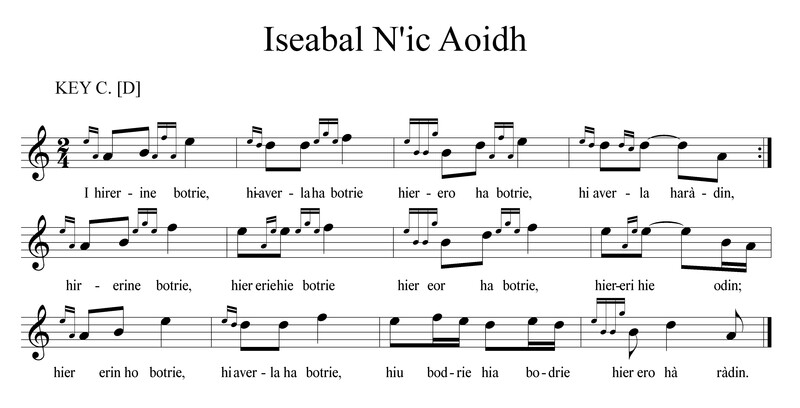 There are twenty pibrochs given in this collection, syllables being used instead of notes, the system which was in vogue before the staff notation became general for piping music, which it did some time prior to 1837. This system was not confined to the MacCrimmon pipers and their disciples. The MacArthurs, pipers to the Lord of the Isles, the Campbells of Lorn, and other teachers had different words, which have not been recorded, but which agreed in rhythm with the MacCrimmon system. These are the words for the first four bars, but, both Captain MacLeod and John MacCrimmon having been unacquainted with the staff notation, they went straight on instead of making a sign that the first four bars should be repeated. There are 16 lines in the first measure, each corresponding to a bar, and it is obvious that the first four must have been repeated, as the symbols are identical, either that, or they played it differently from what we do at the present day, as it has been noted down in staff notation. I suspect also they should have had long and short acute and grave accents upon some of the words. The word “radin”’ – the last word in the fourth bar – should, in my opinion, have been written rà-din, the “rà” being a minim in its significance. hin do, ho dro, hin do, ho dra. 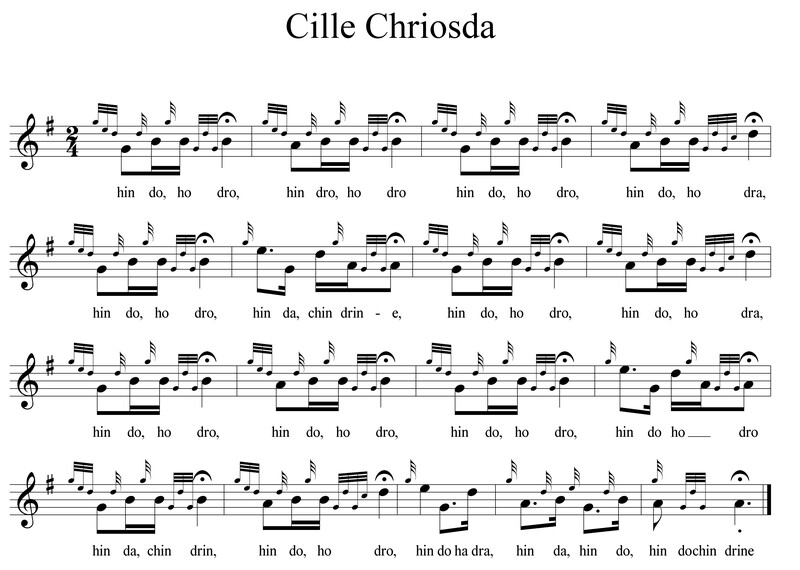 In the late J.F Campbell’s “Canntaireachd” or articulate music, published in 1880, he gives “Cille Chriosd” in the staff notation, with the syllables from Captain Macl.eod’s collection, but he must have given it to a German professor, as it has been turned out on five flats, 6/8 time and hardly recognisable! Mr Campbell mentions that in February, 1880, Duncan Ross, the Duke of Argyll’s piper, who learned tunes orally in Ross-shire from the chanting of John MacKenzie, who was Lord Breadalbane’s piper, and a pupil of the Skye school, read the book of 1828, and played from it at sight. The upshot of Ross’ demonstration was that when three notes occurred together on the same line of the stave, by striking three notes with the little finger, two of which were opened and one closed, representing “hiririn” or hir-ir-in. The same Duncan Ross above-mentioned asserted that 150 years ago the pipers did not use grace notes, and their pipes had only two drones. That can hardly be correct, as we have got a picture of a bagpipe that was played in the ’45 and it had three drones, the longest being very long, and it could be heard at a distance of eight miles. No doubt many would have [had] pipes with only two drones. As to the use of grace notes by the earlier pipers, I suspect they have been in use for a very long time. They were evidently used by the MacCrimmons. I can tell that from their articulate music. but probably not to the same extent as they are at the present day. Duncan Ross was probably right in saying that they played mostly ceol mòr – great music or pibrochs – ceol beag or small music being beneath their notice. The bagpipes must be much older than we have any conception of, for I find that amongst the very earliest form of worship, long before the dawn of any civilisation, proper processions were formed headed by a piper, which would be at least two thousand years before the Christian era. One thing the “Puirt-a-Beul” show very clearly, and that is that they have grown with the people, and are in all human probability as old as their language. I agree entirely with Lieutenant MacLennan of Edinburgh that many of our pibrochs were never noted down properly.